It’s been over a month since I updated the website. Wow, where did THAT go? Well, we have been busy with a new project and a couple of ongoing ones. I wrote last time about Mirror Coat. That’s a mature project that is nearing completion, now, we’re just hammering out a few details. The Amen Choir just finished their last scratch track yesterday, as we bade farewell to their drummer who had to return to Trinidad. 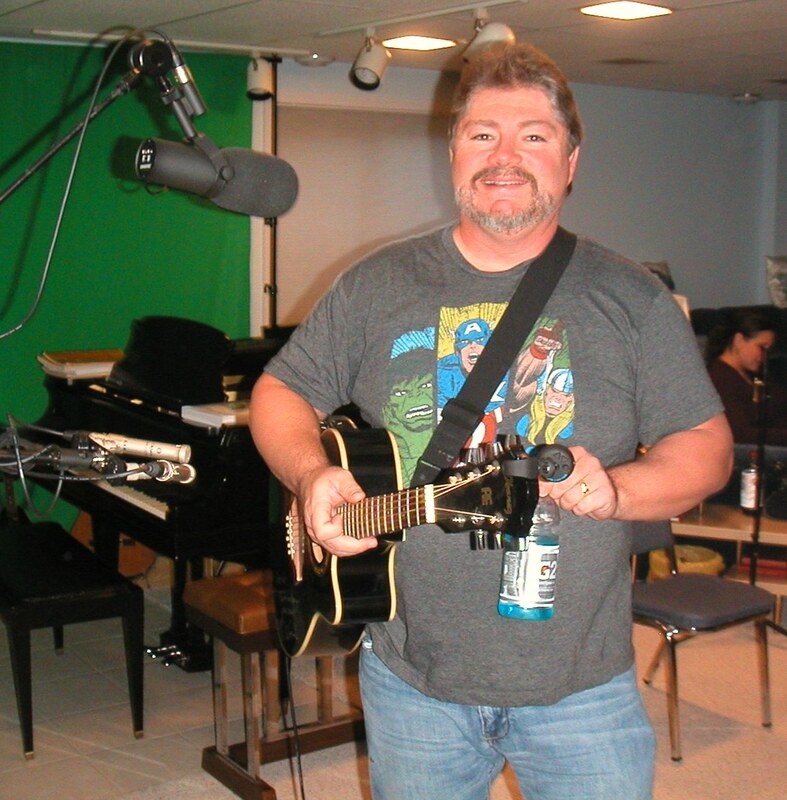 Derrick Patterson has now recorded two original songs here and we look forward to more of his work! On Saturday, June 1, we had returning client Derrick Patterson in the studio. This time he brought “Smokin’ Guns”, his band, and we had a great session. They recorded 4 songs, including Derrick’s newest one named “She’s Off the Scale.” Derrick really hit the zone with this song, and as a promotional tool we will be giving away copies of it on this website. I’m doing a couple of tracks on that song, just because it’s a fun song. Look for that in the next day or two. So, with all of this going on, today is actually the last day of teaching for the Spring 2013 semester. We have a week off, then will resume teaching our regular hours the week of June 17th. Some of my students are taking the summer off, so I do have some openings if you’re interested. I hope your gardens are further along than ours. It’s been a very cold, wet spring and to top it off we have a couple dozen too many rabbits in the yard. This is the first year we’ve had to put up fence. Fun fact: Euphonic Studio is located in the part of Mount Vernon that is referred to as “Rabbit Town” because of its cultural past. The story goes that a large number of folks here were Bohemians and they raised rabbits for food. Over the years, with lots of domestic rabbits joining the local rabbit population, we have a particularly tame yard rabbit that will just sit and watch as you throw a stick at them. They won’t move, even if you hit them. Good grief.